← If At First You Don’t Know . . .
Women’s History Month provides reminders of the importance of the contributions of women to our present society, culture, and communities. Many women did this by filling traditional roles, but others took on non-traditional, necessary tasks—and some of them were the first to do so. One such Davenport woman was Lottie Bois Clapp. Lottie’s father, Morse Boise, was an embalmer who ran a mortuary at 323 Perry Street in 1857. When he died in 1890, Margaret Boise, Lottie’s mother, ran the business with the help of the Clapp family, including Seldon B. Clapp, whom Lottie married in 1895. When Seldon died in 1911, Lottie not only followed her mother’s example and took over the management of the mortuary, she earned her embalmer’s license, becoming the Tri-City area’s first and — at least until her death—only female embalmer. This was, according to newspaper advertisements of the time, something of a reassurance to ladies who were uncomfortable with the idea of their remains being “seen to” by a gentleman embalmer. Lottie Clapp knew about networking long before it became a buzzword: she retained memberships in the Women’s Relief Corps, the Order of the Eastern Star, the Oriental Shrine of Jerusalem, the Scott Zedoka Lodge, the Mississippi Valley Funeral Directors Association, the Business and Professional Women’s Club, and the King’s Daughters. And she remained in charge of the family business until her death in 1933. Her body was held in state at the Clapp Mortuary until the funeral at St. John’s Methodist-Episcopal Church. She was buried in Oakdale Cemetery. The business was run by her sons, Seldon and Alan Clapp—who had followed in their mother’s footsteps to become embalmers themselves—for only two years. We suppose it just wasn’t the same without Lottie. “Mrs. Lottie Clapp, Only Tri-City Woman Embalmer, Dies; Directed Mortuary.” Davenport Democrat, 1Jan1933, p.8. 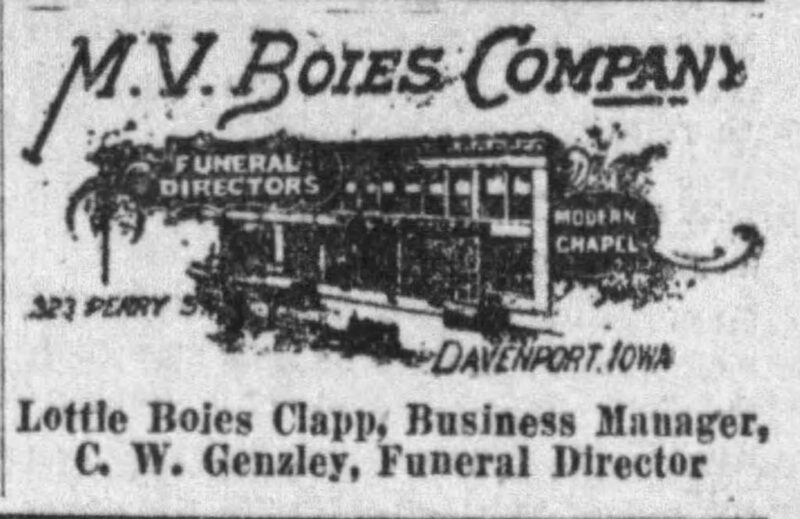 This entry was posted in Local History and tagged Clapp Mortuary, Davenport (Iowa), Lottie Boies Clapp, Women's History. Bookmark the permalink.